Generally, APCs activate CD4 T cells against peptides derived from exogenous Ag in the context of MHC II molecules. In this study, using transgenic B lymphocytes as model APCs, we demonstrate CD4 T cell priming in vivo against peptides derived from endogenously synthesized Ag targeted either to the cytosol or to the endoplasmic reticulum (ER). Surprisingly, priming by Ag containing the KDEL-retention motif yielded higher levels of two important proinflammatory cytokines, IFN-γ and TNF-α, in responding CD4 T cells. Importantly, we found that KDEL-mediated retention of Ag up-regulates ER-stress responsive genes in primary B lymphocytes. We also found that thapsigargin treatment of A20 lymphoma cells up-regulates transcription of ER stress and proinflammatory genes along with IL-23p19. Induction of ER stress by thapsigargin also up-regulated IL-23p19 in primary B lymphocytes, macrophages, and bone marrow-derived dendritic cells. We conclude that perturbation of the secretory pathway and/or ER stress play an important role in modulating the gene program in professional APCs and in shaping CD4 T cell responses in vivo. These findings are relevant to a better understanding of the immune response after infection by viral and bacterial pathogens and the pathogenesis of certain autoimmune diseases. Major histocompatibility complex class II molecules expressed by APCs display immunogenic peptides to CD4 T cells, and, along with proper costimulation, prime a T cell immune response. Traditionally, peptides that bind MHC class II are generated through a process that involves Ag up-take, and processing in degradative organelles, such as MIIC, that are rich in MHC class II (1). Previous studies have reached the conclusion that a majority of peptides associated with MHC class II molecules are derived from exogenous Ag internalized through scavenger receptors, or from membrane-bound proteins (2, 3). Notwithstanding this general idea, in vitro studies have shown that immunogenic peptides can also be generated from both endoplasmic reticulum (ER)4 - and cytosol-localized Ag (4, 5, 6, 7, 8, 9, 10, 11). In agreement with this is the fact that 30% of MHC class II molecules are occupied by peptides from non-membrane associated intracellular Ags (12). However, little is known on the influence presentation of intracellular Ag may have on CD4 T cell priming in vivo, which is a key event in the initiation of adaptive immune responses. T cell priming depends on adequate cell surface display of peptide-MHC complex (signal 1) by professional APCs (dendritic cells, macrophages, and B lymphocytes), and it requires adequate costimulation (signal 2) to orchestrate a fully functional immune response. Lack of costimulation through CD80, CD86, CD40, or OX40L have been shown to impact many aspects of T cell function such as priming, initial expansion, survival, and memory (13). OX40L has been shown to play a role in the initial CD4 T expansion, subsequent memory induction (14), and its expression by B lymphocytes is necessary for the induction of Th2 immunity (15). The ER stress/unfolded protein response (UPR) pathway is a cellular response to an overloaded secretory pathway that is integral to normal cellular homeostasis. Cells that accumulate misfolded or mutant protein in the ER initiate a transcriptional gene program to restore normal cellular folding and secretion equilibrium (16, 17). In general, the UPR pathway results in the up-regulation of genes responsible for ER biogenesis, protein folding, cell survival, and ultimately apoptosis. In B lymphocytes, it is an important cell differentiation checkpoint as the UPR-inducible transcription factor XBP-1 is required for plasma cell differentiation (18). However, the effects of the UPR pathway on the Ag presenting function of B cells, clonal T cell expansion, and the activation of adaptive immune responses is unknown. In this study, we sought to determine whether a different intracellular localization of endogenously synthesized Ag has any effect at the level of the APC and of the CD4 T cell response in vivo. To this end, we used a model system, developed in this laboratory, whereby adaptive T cell responses can be induced using B lymphocytes programmed as APCs by spontaneous transgenesis of plasmid (p)DNA (19, 20). In this model of immunization, pDNA codes for the H chain of a secretory Ig (IgH) molecule. Ag specificity is imparted by DNA sequences coding for heterologous T cell epitopes engineered in the complementarity-determining regions of a rearranged variable (V) domain (21). Previously, we showed that a single i.v. injection of transgenic B lymphocytes as APCs primes both CD4 and CD8 T cell responses in the spleen and lymph nodes (20), and that the generation of CD4 responses requires MHC class II expression on the injected transgenic APCs. Thus, since pDNAs (transgenes) can be easily engineered with different targeting motifs, and the APCs can be programmed accordingly, this system constitutes an ideal model system to study how endogenously synthesized Ag and ER stress affect the APC and in turn the CD4 T cell response in vivo. C57BL/6 Mice were purchased from Harlan Sprague Dawley. MHC class II-deficient mice on a C57BL/6 background were purchased from Taconic. All mice were housed at the University of California San Diego Animal Facility and handled in accordance with University of California-San Diego Animal Subjects Program Guidelines. J558L cells were originally obtained from Dr. S. Morrison (University of California, Los Angeles, CA). Plasmids encoding the secretory IgH genes were made as previously described (22) with the following modifications: for cytosolic targeting, the leader sequence was removed using a Quick Change XL site directed mutagenesis kit from Stratagene. For ER targeting, a ClaI and a NotI site was added 3′ of the γ1 coding region using a Quick Change XL site directed mutagenesis kit from Stratagene. A pair of complementary oligonucleotides coding for SEKDEL with a 3-alanine spacer were inserted between these restriction sites. The heterologous peptide Eα (ASFEAQGALANIAVDKA) was inserted into the variable regions as previously described (23). Plasmid pEGFP was purchased from Clontech Laboratories. pMACS Kk plasmid was purchased from Miltenyi Biotech. All plasmid sequences were confirmed by sequencing at the University of California San Diego Cancer Center Core Sequencing Facility. Plasmids were prepared using Wizard Plus Maxi-prep kit from Promega. Eα peptide 56–73 (ASFEAQGALANIAVDKA) was synthesized at the Ohio State University Peptide Synthesis Facility. Tunicamycin and thapsigargin were purchased from Calbiochem. CpG ODN 1826 was kindly provided by Dr. P. Lenert (University of Iowa, Iowa City, IA). Goat anti-calnexin Ab was purchased from Santa Cruz Biotechnology. Donkey anti-goat-Cy3 and donkey anti-human γ1 FITC Abs were purchased from Jackson ImmunoResearch Laboratory. Goat anti-human IgG Abs labeled with HRP were purchased from Sigma-Aldrich. PE-conjugated Abs anti-mouse I-Ab, CD19, CD86, CD40, OX40L, CD4, CD8; FITC-conjugated IFN-γ; and a biotinylated anti-mouse Kk were purchased from BD Pharmingen. Allophycocyanin-conjugated CD4 was purchased from eBioscience. Spontaneous lymphocyte transgenesis was performed as previously described (19) with the following modifications. Briefly, spleen cells were harvested, washed with PBS and incubated with 25 mg of pDNA for 1 h at 37 °C together with the PMACS Kk plasmid (Miltenyi Biotec) coding for a truncated mouse H-2 Kk molecule as selectable cell surface marker. After overnight incubation, transgenic cells were magnetically sorted and analyzed by flow cytometry for EGFP expression on a FACSCalibur (BD Biosciences). J558L cells (10 × 106) were transfected by electroporation with 50 μg of linearized pDNA in ice-cold PBS without Ca2+ and Mg2+ and shocked twice at 300 mV. Cells were incubated on ice for 15 min and then allowed to recover in RPMI 1640 containing10% FBS for 48 h. Cells were then grown under G418 selection 1 mg/ml for 14 days. Supernatants and lysates of clones were then screened by capture ELISA for production of IgH polypeptides (24). Detection of intracellular immunoreactive transgenic IgH products was also performed by ELISA on cell lysates obtained by freeze-thaw. Cell lysates were tested at 1/10 dilution. CD4+ and CD8+ T cells were isolated from the spleens of immunized mice by negative selection using CD4 and CD8 isolation kits from Stem Cell Technologies. B lymphocytes were isolated from spleens of naive C57/Bl6 mice by negative selection using a B cell isolation kit from Stem Cell Technologies. Cell populations were greater than 90% pure as determined by flow cytometry with appropriate Abs. Kk-positive cells were isolated using a biotinylated anti-Kk Ab, and a biotin selection kit from Stem Cell Technologies. Dendritic cells were generated from the bone marrow of C57BL/6 mice by culture in the presence of GM-CSF (40 ng/ml) and IL-4 (4 ng/ml) for 7 days. Macrophages were generated from bone marrow cells incubated with 30% L929-conditioned medium for 7 days. Adherent cells were removed by scraping. J558L transfectoma were fixed and permeabilized using the CytoFix/CytoPerm kit from BD Pharmingen. Cells were then incubated with goat anti-calnexin primary Ab for 1 h at room temperature. Cells were then incubated with donkey anti-goat-Cy3 and donkey anti-human-FITC Abs. Cells were washed and spun onto slides using a cytospin centrifuge. Stained cells were imaged at the University of California San Diego Cancer Center Digital Imaging Shared Resource using a Photometrics CCD mounted on a Nikon TE-220 inverted epifluorescence microscope at ×100 magnification. Images were deconvoluted using Soft Worx (Applied Precision). A total of 4 × 105 splenocytes were incubated, in triplicate, in a round-bottom 96-well plate with either medium or 50 μg/ml Eα peptide. At 72 h, 1μCu of [3H]-labeled thymidine was added to each well, and cells were harvested onto filter mats and read on a Wallac β counter 16 h later. Results obtained by stimulation with peptide are expressed as cpm from which cpm of cultures in medium only were subtracted. Tests were performed in triplicate. Supernatants of 48-h triplicate cultures were pooled and assayed with a mouse Th1/Th2 cytometric bead array (BD Pharmingen). Data were acquired using a BD FACSCalibur, and analyzed by BD CBA software (BD Biosciences). Statistical analysis was performed using Prism software from GraphPad, and significance was determined using a two-tailed unpaired t test. Total RNA was extracted from cells using an RNeasy kit from Qiagen. cDNA was synthesized using a poly(T) primer from 50 ng of total RNA using Sensiscript Reverse Transcriptase (Qiagen). Primers used for PCR analysis had the following sequence: human γ1; tcaaggactacttccccgaacc and tactccttgccattcagccagccagtcc, MyD116; gagaagagggagtggctgagc and agcattccgacaagggtgacc, Chop; ccctgcctttcaccttgg and ccgctcgttctcctgctc, Grp78; ctgggtacaatttgatctgacgg and gcacctggtggctttcccagcattc, and β-actin tgggccgccctaggcacc and cggttggccttagggttcag. PCR was conducted for 30 cycles using platinum Pfx polymerase from Invitrogen. The nested PCR for mIL-23p19 was performed using the following primers: IL23 Forward (5′-GTGCCTAGGAGTAGCAGTCCGA-3′) and IL23 Reverse (5′-TGGCTGGAGGAGTTGGCTGA-3′) for 30 cycles, and then IL23 Forward N (5′-TGCATGCTAGCCTGGAACGC-3′) and IL23 Reverse N (5′-GGG AGTAGAGCAGGCTCCCC-3′) also for 30 cycles. cDNA was generated from 200 ng of total RNA using Omniscript Reverse Transcriptase (Qiagen). qRT-PCR was conducted using the TaqMan method on an ABI Prism 7700, normalized to β-actin, and analyzed by comparative Ct analysis. Sequences for probes and primers were as follows: mIL-23a-p19 (NM_031252.1)-171Forward TGGCTGTGCCTAGGAGTAGCA; 246Reverse CAGGCTAGCATGCAGAGATTCC; 200TaqMan probe TGG GCT CAG TGC CAG CAG CTC TC; mβ Actin-(GI49865)-379 Forward TTCAACACCCCAGCCATGTA; 447Reverse TGTGGTACGACCAGAGGCATAC; 402TaqMan probe AGCCATCCAGGCTGTGCTGTCCC. Results were expressed as fold change compared with unstimulated cells. Biotinylated cRNA was prepared using the Illumina RNA Amplification kit, Catalog no. 1L1791 (Ambion) according to the manufacturer’s directions starting with ∼250 ng total RNA. The labeling approach uses a modified Eberwine protocol (25) by which messenger RNA is converted to cDNA, followed by an amplification/labeling step mediated by T7 DNA polymerase. The cDNA and cRNA filter cartridges (Ambion) were used according to the manufacturer’s instructions for room temperature and in vitro transcript cleanup, respectively. For microarray analysis, the Illumina Mouse 6 Sentrix Expression BeadChip was used (Illumina). Hybridization of labeled cRNA to the BeadChip, washing, and scanning were performed according to the Illumina BeadStation 500× manual. Essentially the amplified, biotin-labeled human cRNA samples were resuspended in a solution of Hyb E1 buffer (Illumina) and 25% (v/v) formamide at a final concentration of 25 ng/μl. A total of 1.5 μg of each cRNA was hybridized. Hybridization was allowed to proceed at 55°C for 18 h, after which the bead array matrix was washed for 10 min with 1× high temperature buffer (Illumina), followed by a subsequent 10-min wash in Wash E1BC buffer. The arrays were then washed with 100% ethanol for 10 min to strip off any remaining adhesive on the chip. A 2-min E1BC wash was performed to remove residual ethanol. The arrays were blocked for 5 min with 1% (w/v) casein-PBS (Pierce). The array signal was developed via 10-min incubation with streptavidin-Cy3 at a final concentration of 1 μg/ml solution of (GE Healthcare) in 1% casein-PBS blocking solution. The Mouse 6 Sentrix Expression BeadChip was washed a final time in Wash E1BC buffer for 5 min and subsequently dried via centrifugation for 4 min at a setting of 275 × g. The arrays were scanned on the Illumina BeadArray reader, a confocal-type imaging system with 532 (cye3) nm laser illumination. Image analysis and data extraction was conducted as previously reported (26). The array images were registered using an algorithm described previously (27). Essentially the bead signals were computed with weighted averages of pixel intensities, and local background is subtracted. Sequence-type signal was calculated by averaging corresponding bead signals with outliers removed (using median absolute deviation). Preliminary data analysis and QC was conducted using the BeadStudio software (Illumina). To determine whether the ability of endogenously synthesized Ag to prime a CD4 T cell response varies depending on the intracellular localization of Ag, we compared secretory IgH, IgH retained in the ER via a KDEL ER-retention motif, and IgH targeted to the cytosol via deletion of the N-terminal leader sequence. The expressed IgH products are referred to as γ1VH denoting the wild-type secretory IgH, γ1VHKDEL denoting ER targeting, and γ1 ΔL11VH denoting cytosolic targeting. Stable transfectants of J558L cells, a murine plasmacytoma that possesses a λ1 L chain but expresses no endogenous H chain, were used to ensure that the engineered γ1VHKDEL and γ1ΔL11VH IgH molecules were targeted to the intended intracellular compartment, and not secreted. Upon transfection with a wild-type IgH transgene, J558L cells produce complete H2L2 (IgG) molecules, which can be detected by capture ELISA. We found no transgenic IgG in γ1VHKDEL or γ1ΔL11VH transfectoma supernatants (Fig. 1⇓A), despite the fact that both γ1VHKDEL and γ1ΔL11VH transfectoma expressed the transgene by RT-PCR (Fig. 1⇓B). By ELISA transgenic products were detected in soluble intracellular fractions (data not shown). Of note, the detection of immunoreactive transgenic products in cell lysates was higher for the γ1VHKDEL transfectoma than for the γ1VH transfectoma (A450 duplicate values 1.55/1.67 vs 0.59/0.62, respectively). Although the nature of the immunoreactive products in the γ1VHKDEL transfectoma was not investigated, it likely includes a mixture of properly folded, unfolded, and degraded transgenic IgH polypeptides. The higher content of transgenic products in the γ1VHKDEL transfectoma lysate suggests that KDEL promotes intracellular retention, and that γ1VHKDEL transfectoma are consequently subject to a heavier cargo of transgenic IgH polypeptides than transfectoma harboring the secretory IgH transgene. Additional experiments will need to establish that even though levels of transcription of the different transgenes are similar (Fig. 1⇓B), the γ1VHKDEL transfectoma do not undergo greater translation. Intracellular targeting and trafficking of engineered IgH proteins. J558L cells were stably transfected with plasmids expressing the IgH transgene targeted to the secretory pathway (γ1VH), the ER (γ1VHKDEL), or the cytosol (γ1ΔL11VH), respectively. A, B cell transfectoma harboring the transgene targeted to ER or the cytosol do not secrete transgenic IgH molecules as determined by a sandwich ELISA for the human IgG constant region of the transgenic product. Tests were performed on supernatants of stable tansfectants. B, Transgene expression in B cell transfectoma. RT-PCR for the IgH transgene was performed on total RNA extracted from transfected J558L cells, β-actin serves as a control for RNA quality. C, Intracellular localization of the transgenic product in B cell transfectoma. J558L cells were analyzed by deconvolution microscopy as described in Materials and Methods. Staining for human γ1 is shown in green (left panels) and for the ER marker calnexin in red (middle panels). The overlay (right panels) shows areas of colocalization in yellow. Proper intracellular compartment localization was further assessed by deconvolution microscopy. To this end, stably transfected J558L cells were stained for both the ER marker calnexin and the human γ1 portion of the IgH transgene (Fig. 1⇑C). Both the γ1VH and the γ1VHKDEL proteins showed a predominantly vesicular staining that colocalized with calnexin. The ΔL11γ1VH protein showed no colocalization with calnexin and produced a predominantly puntiform staining shown previously to correspond to cytosolic localization of an IgH polypeptide in cell lines expressing high levels of this protein (28). To assess the in vivo APC function of B lymphocytes expressing endogenously synthesized Ag localized to different intracellular compartments, we engineered IgH transgenes to express in the complementarity-determining region 3 the amino acid sequence ASFEAQGALANIAVDKA, an immunodominant determinant from the α-chain of the I-Eb molecule that is presented by I-Ab. In C57BL/6 mice that do not express the I-Eb allele, the Eα peptide is non-self and readily induces a T cell response (29). C57BL/6 mice immunized by i.v. injection of syngeneic B lymphocytes transgenic for Eα mounted a strong and specific proliferative response irrespective of the intracellular compartment targeted (Fig. 2⇓a). In the experiment, 7/11 mice injected with γ1Eα3 transgenic B lymphocytes, 11/11 mice injected with γ1Eα3KDEL transgenic B lymphocytes, and 12/12 mice injected with γ1ΔL11Eα3 transgenic cells responded to immunization. Interestingly, no significant difference in the magnitude of the response was observed among mice of the three groups. To verify that responding cells were in fact CD4 T cells, splenic CD4 and CD8 T cells were isolated by negative selection and restimulated with LPS blasts from naive C57BL/6 mice pulsed with the Eα peptide. Only CD4 T cells proliferated in vitro upon restimulation with the Eα peptide (Fig. 2⇓b), indicating that Eα-specific CD4 T cells had been primed. T cell priming also required MHC class II expression on the injected B lymphocytes (Fig. 2⇓c), despite normal levels of transfection (data not shown). Thus, B lymphocytes presenting endogenously synthesized Ag can prime CD4 T cells irrespective of its intracellular targeting. Endogenously synthesized Ag retained in the ER or in the cytosol primes a CD4 T cell response. a, Naive C57BL/6 mice were immunized with Ag presenting B lymphocytes transgenic for γ1Eα3 (inverted triangles), γ1Eα3KDEL (circles) or γ1ΔL11Eα3 (triangles) or γ1 NV2NA3(diamonds). Splenocytes were harvested on day 14 and proliferation after restimulation with Eα peptide was measured by [3H]thymidine incorporation. Each data point represents the mean of triplicate wells. Only values from responding mice are shown. b, Naive C57BL/6 mice were immunized with B lymphocytes transgenic for γ1Eα3 (left), γ1Eα3KDEL (middle), or γ1ΔL11Eα3 (right), respectively. On day 14, CD4 and CD8 T cells were isolated by negative selection. Cells were then restimulated with LPS-treated B lymphocytes with or without Ea peptide, and then assayed for proliferation as indicated above. Results refer to two mice/group. c, B lymphocytes from either wild-type C57BL/6 mice (filled symbols) or MHC class II −/− mice (open symbols) were rendered transgenic with either γ1Eα3KDEL (squares) or γ1ΔL11Eα3 (circles), and used to immunize naive C57BL/6 mice. 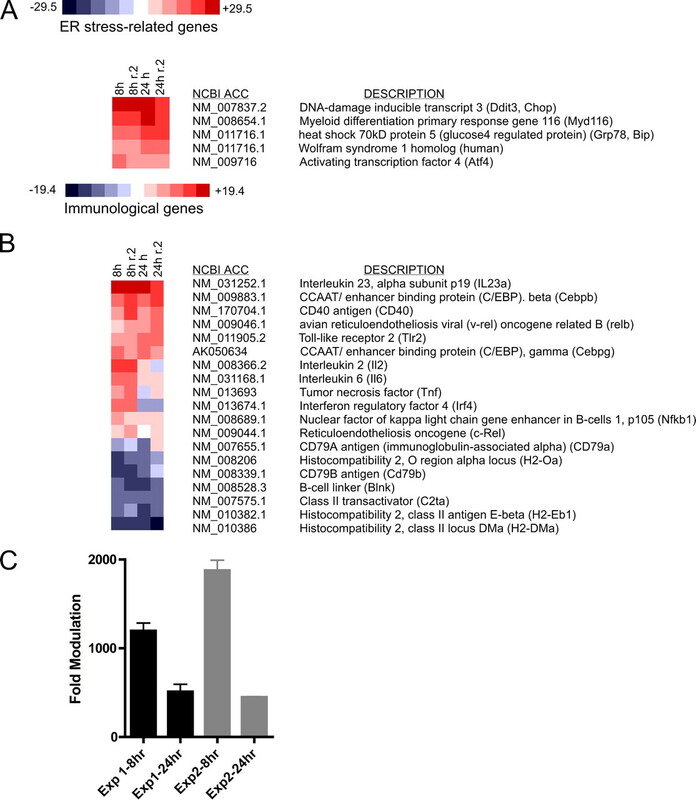 Splenocytes were harvested 14-days postimmunization and proliferative responses were analyzed as described in a. d–g, Mice were immunized with Ag presenting B lymphocytes transgenic for γ1Eα3KDEL (black bars, n = 6), γ1Eα3 (gray bars, n = 7), or γ1ΔL11Eα3 (open bars, n = 8). Splenocytes were harvested at 14 days and stimulated with the Eα peptide for 48 h. Levels of cytokines in culture supernatants were measured by the cytometric bead array (BD Biosciences) for IFN-γ (d), TNF-α (e), IL-2 (f), and IL-4 (g). Results represent average amounts ± SEM after peptide stimulation. Significance (p < 0.05) was determined using an unpaired two-tailed t test and is indicated with a ∗. Values (pg/ml) obtained from splenocytes cultured with medium alone are as follows: γ1Eα3KDEL; IFN-γ (11.4 ± 16.2), TNF-α (8.8 ± 5.3), IL-2 (21. ± 13.9), IL-4 (5.4 ± 1.9), γ1Eα3; IFN-γ (12.1 ± 16.6), TNF-α (11.0 ± 10.2), IL-2 (16.7 ± 15.1), IL-4 (3.94 ± 1.7), γ1ΔL11Eα3; IFN-γ (5.9 ± 7.7), TNF-α (8.3 ± 4.6), IL-2 (21.3 ± 10.8), IL-4 (7.1 ± 2.1). When we profiled the cytokines secreted by responding T cells using a cytometric bead array, we found that there was no significant effect on IL-2 or IL-4 secretion (Fig. 2⇑, f and g). However, T cells primed by B lymphocytes transgenic for γ1Eα3KDEL produced significantly more IFN-γ and TNF-α (Fig. 2⇑, d and e) than T cells primed by transgenic B lymphocytes presenting cytosolic or secreted Ag. Interestingly, ER-retained Ag showed an increase in these two cytokines compared with secretory Ag, which also traffics through the ER. Since this was unexpected, new experiments were planned to understand the reasons for this difference. To rule out the possibility that the above effects could be due to intrinsic properties of the plasmids used (e.g., immunostimulatory DNA motifs), we isolated B lymphocytes from naive mice by negative selection, incubated them with 25 μg/ml of either the γ1Eα3KDEL or γ1Eα3 plasmid, and recorded proliferation at 48 h. Since B cell proliferation is a classic response to B cell mitogens like CpG (30) or endotoxin, this would rule out a contribution by these factors to the previous experiments. We found that when compared with LPS or CpG ODN, pDNA induced a similar magnitude of proliferation as control ODN (Fig. 3⇓), confirming that pDNA is not mitogenic for B lymphocytes (31, 32). In contrast, B lymphocytes incubated with γ1Eα3KDEL or γ1Eα3 pDNA did up-regulate the costimulatory molecule CD86 (data not shown), another marker of B cell activation. 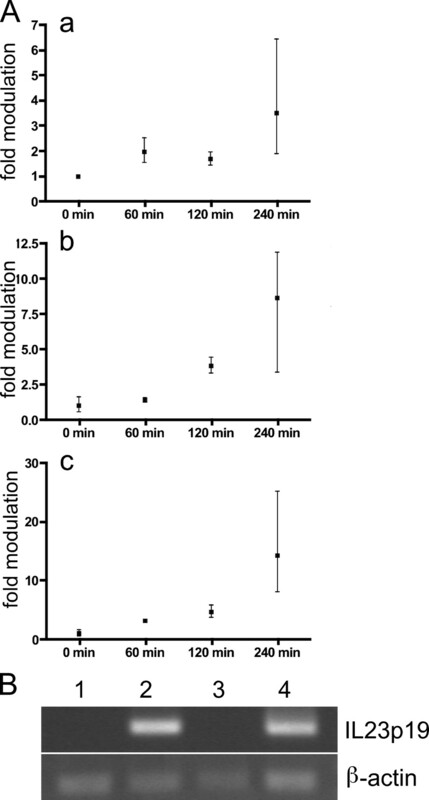 Together these experiments show that the two plasmids did not differ in their ability to stimulate B lymphocytes during the initial stages of activation. Differences in pDNA composition do not account for different immune responses in vivo. Splenic B cells were isolated by negative selection and incubated with non-CpG ODN (black bar), 25 μg/ml Eα3γ1(gray bar), 25 μg/ml Eα3γ1KDEL (open bar), 2.5 μg/ml LPS (checkered bar), or 0.1 μM CpG ODN 1826 (cross-hatched bar) for 24 h. Proliferation was determined by [3H]thymidine incorporation. Values represent means ± SD of triplicate wells. To elucidate factors that could influence the Ag presenting function of B lymphocytes, we engineered plasmids containing the selectable surface marker H2 Kk to aid the identification and isolation after injection in vivo. C57BL/6 mice were injected i.v. with 1 × 106 B lymphocytes transgenic for γ1Eα3KDEL-Kk or γ1Eα3-Kk. Control mice were injected with B lymphocytes transgenic for a plasmid that expressed only Kk (pMACS Kk). Twenty four hours after transgenesis, we saw comparable up-regulation of I-Ab or of the costimulatory molecules CD86, CD40, and OX40L in transgenic B lymphocytes irrespective of the plasmid used for their transfection (Fig. 4⇓A, a–d). Both γ1Eα3KDEL-Kk and γ1Eα3-Kk transgenic lymphocytes showed up-regulation of I-Ab, CD86, and CD40 when compared with non-transfected B lymphocytes isolated from the spleens of naive mice, indicating that some activation had already occurred before injection. However, after 3 days, that is at the time when T cells reach the height of clonal expansion after encounter with Ag (33), Kk-positive B lymphocytes re-isolated from the spleens of mice injected with B lymphocytes transgenic for either γ1Eα3KDEL-Kk or γ1Eα3-Kk showed marked up-regulation of I-Ab, CD86, and CD40 when compared with mice injected with B lymphocytes transgenic for pMACS Kk only (Fig. 4⇓A, e–g). Oddly, we also noticed a small decrease in OX40L expression by γ1Eα3KDEL-Kk cells (Fig. 4⇓Bh), but further investigation using an in vitro priming system revealed that this did not correlate with enhanced IFN-γ production (data not shown). Of note, B lymphocytes transgenic for γ1Eα3KDEL-Kk harvested on day 3 (in vivo) showed similar recovery relative to the other groups since the yield of live Kk+ transgenic lymphocytes was 69 (γ1Eα3-Kk), 59 (γ1Eα3KDEL-Kk), and 60% (pMACS Kk) of the injected 1 × 106 lymphocytes, respectively. 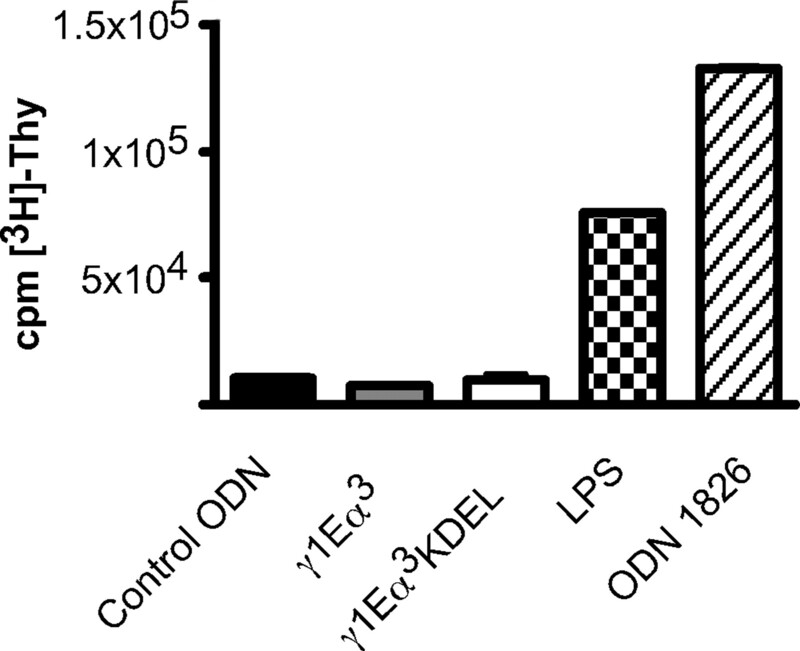 Primary B lymphocytes that express ER retained Ag show diminished OX40L expression in vivo and up-regulate transcription of ER stress responsive genes. A, B lymphocytes were subjected to spontaneous transgenesis with either γ1Eα3-Kk (black line) or γ1Eα3KDEL-Kk (gray line). Kk-positive lymphocytes were isolated 24 h later, and analyzed for expression of I-Ab (a and e), CD86 (b and f), CD40 (c and g), or OX40L (d and h) at days 0 (top row) and 3 (bottom row) after i.v. injection and compared with naive B lymphocytes (gray fill at day 0) or pMACS-Kk transfected B lymphocytes (gray fill at day 3). B, B lymphocytes were rendered transgenic for either γ1Eα3-Kk or γ1Eα3KDEL-Kk and Kk-positive cells were isolated at 24 and 48 h. Total RNA was extracted and RT-PCR was performed for ER stress induced genes Myd116, Chop, and Grp78. RNA from splenic B lymphocytes isolated by negative selection, and treated with 5 μg/ml tunicamycin for 24 h served as a positive control. We reasoned that the KDEL retention motif might lead to up-regulation of canonical ER stress/UPR genes in transgenic B lymphocytes and that this may provide us with new clues to elucidate their Ag presenting function. To this end, we first sought differences in expression of ER stress responsive genes in primary B lymphocytes rendered transgenic with γ1Eα3KDEL as compared with B lymphocytes transgenic for the γ1Eα3 plasmid. Generally, cells that undergo ER stress up-regulate the expression of a number of stress responsive genes, including Myd116, Grp78 (BiP), and Chop (Gadd 153) (17). When we analyzed B lymphocytes transgenic for either γ1Eα3KDEL-Kk or γ1Eα3-Kk at 24 h, we found no up-regulation of the ER stress markers Myd116, Grp78, and Chop. However, at 48 h post-transfection we saw up-regulation of ER stress genes in γ1Eα3KDEL-Kk transgenic B lymphocytes (Fig. 4⇑B), but not in lymphocytes transgenic for γ1Eα3-Kk. Purified B lymphocytes treated with tunicamycin, a compound that induces ER stress by preventing N-linked glycosylation (34), served as a positive control and resulted in a robust expression of all three ER stress responsive genes at 24 h (Fig. 4⇑B). These results indicate that transgenic B lymphocytes that retain KDEL-tagged Ag accumulate enough protein to induce up-regulation of canonical ER stress/UPR genes. To elucidate factors that influence T cell priming we resorted to genome wide expression profiling of a B cell line treated with the ER stress inducing compound thapsigargin. We treated A20 cells with thapsigargin and collected RNA at 8- and 24-h time points. Induction of ER stress responsive genes such as Chop, Myd116, Grp78, Wfs1, and Atf4 was evident at both time points after treatment (Fig. 5⇓A), indicating that thapsigargin adequately induced an ER stress response. Not surprisingly, we observed significant down-regulation of the BCR complex and cell cycle pathways (data not shown). We also saw up-regulation of IFN regulatory factor 4 (Irf4) (Fig. 5⇓B), a transcription factor implicated in plasma cell development (35). These results were expected since ER stress serves as a physiological checkpoint for plasma cell development. Finally, we noticed a significant down-regulation of the MHC class II Ag processing pathway (data not shown), and various accessory molecules such as DM and the CIITA (Fig. 5⇓B). This is consistent with plasma cell development, although it should be noted that while the overall transcriptional levels of MHC class II fell (data not shown), they remained sufficiently high to be detected in vivo (Fig. 4⇑A), suggesting that treatment with thapsigargin may be harsher than ER retention of Ag in promoting ER stress. Alternatively, one cannot rule out the possibility that the cell surface levels of MHC class II in transgenic B lymphocytes in vivo returns to normal by day 3. Gene expression profiling of A20 B lymphoma cells under conditions of ER stress. A20 B lymphoma cells were treated for 8 or 24 h with 300 nM thapsigargin. Total RNA was extracted and analyzed using Illumina bead arrays. Levels of gene expression were compared with untreated A20 cells. Two independent experiments were performed and shown. In the clustergrams, genes are grouped into (A) ER stress responsive genes and (B) immunologically relevant genes. The extremal fold changes are noted on the respective color scales. C, Levels of IL-23p19 gene expression as determined by qPCR. IL-23p19 levels in A20 cells were determined at 8 and 24 h after thapsigargin treatment and compared with untreated cells by comparative Ct analysis. Two independent experiments are shown (experiment 1, black bars; experiment 2, gray bars). Next, we turned our attention to genes that are involved in the inflammatory pathway. We observed an up-regulation of the NF-κB family members p105, Rel-B, and c-rel, and C/EBP β and γ (Fig. 5⇑B). Together, this points to the activation of a proinflammatory transcriptional program. In fact, we saw up-regulation of notable proinflammatory cytokines such as IL-23p19, IL-6, TNF-α, and the T cell survival factor IL-2 (Fig. 5⇑B). Among these, IL-23p19 stands out due to the magnitude of the up-regulation, ∼18-fold at the 8-h time point (Fig. 5⇑B). This up-regulation was confirmed by qPCR analysis (Fig. 5⇑C). Curiously, the p40 subunit that is shared between IL-23 and IL-12 (36) was not up-regulated and neither was IL-12 p35. This suggests that up-regulation of the p40 subunit would require additional signals provided through T cell interaction via CD40, which was up-regulated at 8 h (Fig. 5⇑B). Alternatively, such a robust up-regulation of the p19 subunit may be sufficient to drive assembly of a functional IL-23 p19/p40 heterodimer even though the expression of p40 is not increased. Finally, we noted that the only TLR that was up-regulated was TLR2. To ensure that the above phenomenon was not unique to A20 cells, experiments were performed in primary B lymphocytes, macrophages, and bone marrow-derived dendritic cells. Cells were treated with thapsigargin and the RNA was collected at the time points indicated (Fig. 6⇓A). By qRT-PCR, IL23p19 was up-regulated in all three APCs, suggesting that ER stress-induced activation of IL23p19 is a general phenomenon in these cells. Comparable results were obtained by treating the cells with tunicamycin (not shown). Finally, it was important to show a transcriptional up-regulation of IL23p19 in B lymphocytes after transgenesis with the γ1KDEL plasmid. As shown, 48 h after transgenesis a IL23p19 transcript was detected in B lymphocytes transgenic for γ1Eα3KDEL-Kk but not γ1Eα3-Kk (Fig. 6⇓B) suggesting that transgenic B lymphocytes that retain Ag intracellularly via the KDEL motif also activate transcriptionally the IL23p19 gene. RNA extracted from bone marrow-derived dendritic cells harvested after 1 h of thapsigargin treatment was used solely as positive indicator of IL23p19 transcription. Up-regulation of IL-23p19 in response to ER stress in primary APCs. A, Primary B lymphocytes (a), bone marrow derived dendritic cells (b), and macrophages (c) were treated with 300 nM thapsigargin and IL-23p19 levels were determined by qPCR analysis at the indicated time points. B, B lymphocytes transfected with γ1Eα3-Kk (lane 1), γ1Eα3KDEL-Kk (lane 2), or untransfected (lane 3) were harvested and purified by Kk selection as in Fig. 4⇑ after 48 h of culture in vitro. Total RNA was extracted, normalized, and IL-23p19 transcripts were detected by nested RT-PCR. RNA from dendritic cells after 1 h treatment with thapsigargin (lane 4) served as positive indicator. In this paper, we show that endogenously synthesized Ag processed and presented by B lymphocytes can prime naive mice in vivo to generate CD4 T cell responses irrespective of whether Ag is targeted to the secretory pathway, the cytosolic compartment, or is retained in the ER. Surprisingly, by appending a model Ag with the KDEL retention motif in the APC, we induced a qualitatively different in vivo CD4 T cell response marked by a heightened production of the proinflammatory cytokines IFN-γ and TNF-α. In vitro genome-wide array analysis showed that ER stress of the APC-induced by thapsigargin treatment activates the transcription of the proinflammatory cytokines IL-23, IL-6, and TNF-α. Together these results suggest that ER stress can affect Ag presentation at different levels. Our data suggest a relation between intracellular retention of Ag via the KDEL motif and up-regulation of ER stress genes. This is in line with a previous report showing that the accumulation of misfolded protein subsequent to impairment of retrieval by the KDEL receptor induces ER stress and modulation of MAPK signaling (37). However, short-lived up-regulation of the UPR has been documented in B cells after cross-linking the BCR with anti-Ig Ab in the absence of, or before, increased expression and accumulation of misfolded immunoglobulins in the ER (38, 39, 40). Although this may apply to physiological regulation of B cell biology, it may not directly relate to our studies where B lymphocytes are activated by spontaneous transgenesis (19, 41), a process that, to the best of our knowledge, is independent of cross-linking of the BCR. Thus, a tentative interpretation of the studies presented herein is that up-regulation of ER stress genes is linked with the accumulation of KDEL-tagged H chain protein in transgenic B lymphocytes. Previous studies in vitro indicated that ER stress activates NF-κB transcription resulting in the production of the proinflammatory cytokine COX-2 (42), and also increases T cell adhesion to endothelial cells (43), suggesting an indirect role on T cell function during adaptive immunity. Interestingly, mice that lack the ER stress sentinel IRE-1β are more susceptible to ER stress, are prone to colitis (44), and show expression of the inflammatory marker ICAM-1 in colonic sections, indicating that chronic ER stress can lead to inflammation and autoimmunity. However, a link between ER stress, APC function, and adaptive T cell immunity has, thus far, been relatively unexplored. The experiments presented herein begin to elucidate this possible link and shed light on how ER stress in the APC is anticipatory of a proinflammatory T cell response. Several arguments favor this tentative link. First, perturbation of the secretory pathway function in primary B lymphocytes modifies gene expression favoring the transcriptional activation of proinflammatory cytokines such as IL-23p19, IL-6, TNF-α, and IL-2. Second, intracellular retention of Ag in primary B lymphocytes influences the cell surface expression of at least one costimulatory molecule, OX40L, in vivo. Although we were unable to formally prove that ER stress directly inhibited OX40L expression (data not shown), it remains that perturbation of the secretory pathway may influence the expression of a costimulatory molecule found to be involved in the generation of memory T cell responses (15, 45, 46). Since we recently argued for an inverse correlation between inflammation at the time of priming and the generation of memory T cell responses (47) the present findings suggest that ER stress may produce T cell responses with diminished capacity to evolve into memory responses. Third, since as demonstrated here, all three types of professional APCs, B lymphocytes, dendritic cells, and macrophages are capable of transcriptional up-regulation of IL23p19 in response to ER stress (Fig. 6⇑A), a direct immunological consequence of ER stress on the APC is priming of T cell responses, which then produce larger amounts of IFN-γ and TNF-α. Taken together, these results suggest a scenario where in the presence of, or in reaction to, ER stress, the APC activates genes involved in a proinflammatory response. In turn, this imprints a proinflammatory characteristic on the T cells that are primed in vivo. This view is also consistent with an emerging central role of ER stress in regulation of the immune microenvironment by cytokines since TNF-α can sustain a UPR response (48) and the anti-inflammatory cytokine IL-10 can inhibit the inflammation-induced ER stress response as demonstrated in intestinal epithelia cells (49). Interestingly, the up-regulation of TLR2 in response to ER stress documented here is consistent with the observed transcriptional up-regulation of IL-23p19 and other proinflammatory cytokines, and absence of counter-regulation by IL-10 (50). In conclusion, our results indicate that events that alter trafficking through the ER causing retention of Ag and/or ER stress are likely to lead to a generalized proinflammatory response. As such, the molecular and genome-wide studies presented herein may have important implications to better understand the adaptive immune response against ER stress-inducing viruses, such as hepatitis C virus (51), and against cancer cells in which ER stress has been documented (52). Because a proinflammatory response dominated by IL-23 has been recently linked with the pathogenesis of certain autoimmune diseases (53) and IL-23 seems to be required for inflammatory responses against bacterial and mycobacterial infection (54, 55), our findings are relevant to better understand the nexus between infection and immune pathology. Finally, the proinflammatory effects of ER stress in the APC may be relevant to vaccine design against pathogens and self Ags, including tumor Ags. We are thankful to Drs. M. Gerloni for help with the proliferation assay and P. Lenert for the gift of CpG ODN 1826, S. Farber-Katz for preparing the RNA samples, and Jennifer Lapira at the University of California San Diego Biomedical Genomics Microarray laboratory for Illumina Beadarray processing. ↵1 This work was supported by National Institutes of Health Grant R01CA 92119, University of California, La Jolla, CA 92093. ↵2 The sequences presented in this article have been submitted to EBI Array Express Database (accession number pending). ↵4 Abbreviations used in this paper: ER, endoplasmic reticulum; UPR, unfolded protein response; p, plasmid; qRT-PCR, quantitative RT-PCR. Paul, W. E.. 1998. Fundamental Immunology 4th Ed. Raven Press, New York. Rudensky, A., P. Preston-Hurlburt, S. C. Hong, A. Barlow, C. Janeway, Jr. 1991. Sequence analysis of peptides bound to MHC class II molecules. Nature 353: 622-627. Chicz, R., R. Urban, W. Lane, J. Gorga, L. Stern, D. Vignali, J. Strominger. 1992. Predominant naturally processed peptides bound to HLA-DR1 are derived from MHC-related molecules and are heterogeneous in size. Nature 358: 764-768. Nuchtern, J. G., W. E. Biddison, R. D. Klausner. 1990. Class II MHC molecules can use the endogenous pathway of antigen presentation. Nature 343: 74-76. Brooks, A., S. Hartley, L. Kjer-Nielsen, J. Perera, C. C. Goodnow, A. Basten, J. McCluskey. 1991. Class II-restricted presentation of an endogenously derived immunodominant T-cell determinant of hen egg lysozyme. Proc. Natl. Acad. Sci. USA 88: 3290-3294. Weiss, S., B. Bogen. 1991. MHC class II-restricted presentation of intracellular antigen. Cell 64: 767-776. Malnati, M., M. Marti, T. LaVaute, D. Jaraquemada, W. Biddison, R. De Mars, E. Long. 1992. Processing pathways for presentation of cytosolic antigen to MHC class II-restricted T cells. Nature 357: 702-704. Adorini, L., J. C. Guery, S. Fuchs, V. Ortiz-Navarrete, G. J. Hammerling, F. Momburg. 1993. Processing of endogenously synthesized hen egg-white lysozyme retained in the endoplasmic reticulum or in secretory form gives rise to a similar but not identical set of epitopes recognized by class II-restricted T cells. J. Immunol. 151: 3576-3586. Nimmerjahn, F., S. Milosevic, U. Behrends, E. M. Jaffee, D. M. Pardoll, G. W. Bornkamm, J. Mautner. 2003. Major histocompatibility complex class II-restricted presentation of a cytosolic antigen by autophagy. Eur. J. Immunol. 33: 1250-1259. Zhou, D., P. Li, Y. Lin, J. M. Lott, A. D. Hislop, D. H. Canaday, R. R. Brutkiewicz, J. S. Blum. 2005. 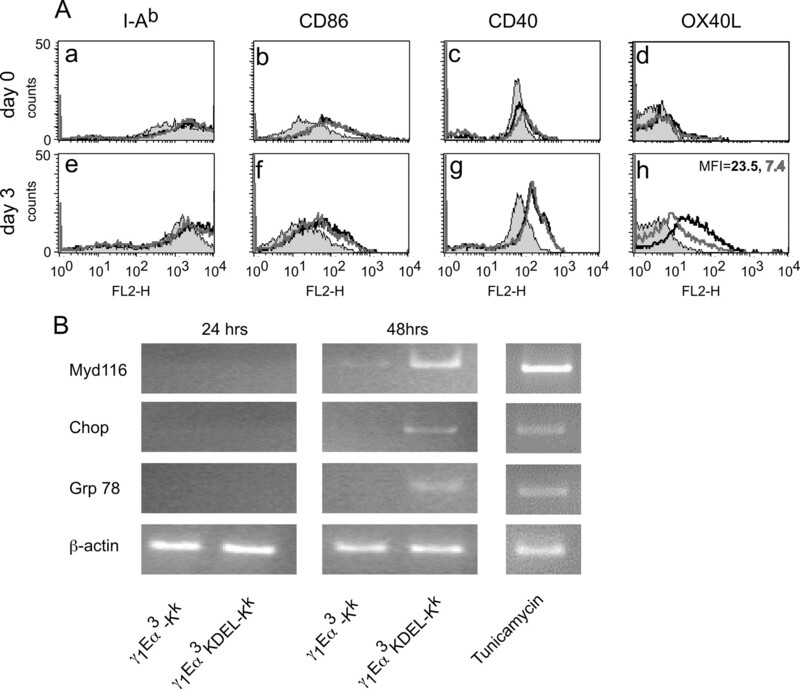 Lamp-2a facilitates MHC class II presentation of cytoplasmic antigens. Immunity 22: 571-581. Tewari, M. K., G. Sinnathamby, D. Rajagopal, L. C. Eisenlohr. 2005. A cytosolic pathway for MHC class II-restricted antigen processing that is proteasome and TAP dependent. Nat. Immunol. 6: 287-294. Dengjel, J., O. Schoor, R. Fischer, M. Reich, M. Kraus, M. Muller, K. Kreymborg, F. Altenberend, J. Brandenburg, H. Kalbacher, R. Brock, C. Driessen, H. G. Rammensee, S. Stevanovic. 2005. Autophagy promotes MHC class II presentation of peptides from intracellular source proteins. Proc. Natl. Acad. Sci. USA 102: 7922-7927. Bluestone, J. A., R. Khattri, G. A. van Seventer. 1999. Accessory Molecules. W. E. Paul, Jr, ed. Fundamental Immunology 4th Ed.449-478. Raven Press, New York. Gramaglia, I., A. Jember, S. D. Pippig, A. D. Weinberg, N. Killeen, M. Croft. 2000. The OX40 costimulatory receptor determines the development of CD4 memory by regulating primary clonal expansion. J. Immunol. 165: 3043-3050. Linton, P. J., B. Bautista, E. Biederman, E. S. Bradley, J. Harbertson, R. M. Kondrack, R. C. Padrick, L. M. Bradley. 2003. Costimulation via OX40L expressed by B cells is sufficient to determine the extent of primary CD4 cell expansion and Th2 cytokine secretion in vivo. J. Exp. Med. 197: 875-883. Schroder, M., R. J. Kaufman. 2005. ER stress and the unfolded protein response. Mutat. Res. 569: 29-63. Filaci, G., M. Gerloni, M. Rizzi, P. Castiglioni, H. D. Chang, M. C. Wheeler, R. Fiocca, M. Zanetti. 2004. Spontaneous transgenesis of human B lymphocytes. Gene Ther. 11: 42-51. Gerloni, M., M. Rizzi, P. Castiglioni, M. Zanetti. 2004. T cell immunity using transgenic B lymphocytes. Proc. Natl. Acad. Sci. USA 101: 3892-3897. Zanetti, M.. 1992. Antigenized antibodies. Nature 355: 466-477. Sollazzo, M., D. Castiglia, R. Billetta, A. Tramontano, M. Zanetti. 1990. Structural definition by antibody engineering of an idiotypic determinant. Protein Eng. 3: 531-539. Sollazzo, M., R. Billetta, M. Zanetti. 1990. Expression of an exogenous peptide epitope genetically engineered in the variable domain of an immunoglobulin: implications for antibody and peptide folding. Protein Eng. 4: 215-220. Xiong, S., M. Gerloni, M. Zanetti. 1997. Engineering vaccines with heterologous B and T cell epitopes using immunoglobulin genes. Nat. Biotechnol. 15: 882-886. Eberwine, J., H. Yeh, K. Miyashiro, Y. Cao, S. Nair, R. Finnell, M. Zettel, P. Coleman. 1992. Analysis of gene expression in single live neurons. Proc. Natl. Acad. Sci. USA 89: 3010-3014. Fan, J. B., J. M. Yeakley, M. Bibikova, E. Chudin, E. Wickham, J. Chen, D. Doucet, P. Rigault, B. Zhang, R. Shen, C. McBride, H. R. Li, X. D. Fu, A. Oliphant, D. L. Barker, M. S. Chee. 2004. A versatile assay for high-throughput gene expression profiling on universal array matrices. Genome Res. 14: 878-885. Galinsky, V. L.. 2003. Automatic registration of microarray images. II. Hexagonal grid. Bioinformatics 19: 1832-1836. Persic, L., M. Righi, A. Roberts, H. R. Hoogenboom, A. Cattaneo, A. Bradbury. 1997. Targeting vectors for intracellular immunization. Gene 187: 1-8. Rudensky, A., S. Rath, P. Preston-Hurlburt, D. Murphy, C. Janeway, Jr. 1991. On the complexity of self. Nature 353: 660-662. Cortez-Gozalez, X., I. Pellicciotta, M. Gerloni, M. C. Wheeler, P. Castiglioni, P. Lenert, M. Zanetti. 2006. TLR9 independent activation of B lymphocytes by bacterial DNA. DNA Cell Biology 27: 253-261. Heit, A., T. Maurer, H. Hochrein, S. Bauer, K. M. Huster, D. H. Busch, H. Wagner. 2003. Cutting edge: toll-like receptor 9 expression is not required for CpG DNA-aided cross-presentation of DNA-conjugated antigens but essential for cross-priming of CD8 T cells. J. Immunol. 170: 2802-2805. Dorner, A. J., L. C. Wasley, P. Raney, S. Haugejorden, M. Green, R. J. Kaufman. 1990. The stress response in Chinese hamster ovary cells: regulation of ERp72 and protein disulfide isomerase expression and secretion. J. Biol. Chem. 265: 22029-22034. Klein, U., S. Casola, G. Cattoretti, Q. Shen, M. Lia, T. Mo, T. Ludwig, K. Rajewsky, R. Dalla-Favera. 2006. Transcription factor IRF4 controls plasma cell differentiation and class-switch recombination. Nat. Immunol. 7: 773-782. Yamamoto, K., H. Hamada, H. Shinkai, Y. Kohno, H. Koseki, T. Aoe. 2003. The KDEL receptor modulates the endoplasmic reticulum stress response through mitogen-activated protein kinase signaling cascades. J. Biol. Chem. 278: 34525-34532.
van Anken, E., E. P. Romijn, C. Maggioni, A. Mezghrani, R. Sitia, I. Braakman, A. J. Heck. 2003. Sequential waves of functionally related proteins are expressed when B cells prepare for antibody secretion. Immunity 18: 243-253. Skalet, A. H., J. A. Isler, L. B. King, H. P. Harding, D. Ron, J. G. Monroe. 2005. Rapid B cell receptor-induced unfolded protein response in nonsecretory B cells correlates with pro versus antiapoptotic cell fate. J. Biol. Chem. 280: 39762-39771. Zanetti, M., P. Castiglioni, M. Rizzi, M. Wheeler, M. Gerloni. 2004. B lymphocytes as APC based genetic vaccines. Immunol. Rev. 199: 264-278. Hung, J. H., I. J. Su, H. Y. Lei, H. C. Wang, W. C. Lin, W. T. Chang, W. Huang, W. C. Chang, Y. S. Chang, C. C. Chen, M. D. Lai. 2004. Endoplasmic reticulum stress stimulates the expression of cyclooxygenase-2 through activation of NF-κB and pp38 mitogen-activated protein kinase. J. Biol. Chem. 279: 46384-46392. Majors, A. K., R. C. Austin, C. A. de la Motte, R. E. Pyeritz, V. C. Hascall, S. P. Kessler, G. Sen, S. A. Strong. 2003. Endoplasmic reticulum stress induces hyaluronan deposition and leukocyte adhesion. J. Biol. Chem. 278: 47223-47231. Bertolotti, A., X. Wang, I. Novoa, R. Jungreis, K. Schlessinger, J. H. Cho, A. B. West, D. Ron. 2001. Increased sensitivity to dextran sodium sulfate colitis in IRE1β-deficient mice. J. Clin. Invest. 107: 585-593. Dawicki, W., E. M. Bertram, A. H. Sharpe, T. H. Watts. 2004. 4-1BB and OX40 act independently to facilitate robust CD8 and CD4 recall responses. J. Immunol. 173: 5944-5951. Zanetti, M., G. Franchini. 2006. T cell memory and protective immunity by vaccination: is more better?. Trends Immunol. 27: 511-517. Xue, X., J. H. Piao, A. Nakajima, S. Sakon-Komazawa, Y. Kojima, K. Mori, H. Yagita, K. Okumura, H. Harding, H. Nakano. 2005. Tumor necrosis factor α (TNFα) induces the unfolded protein response (UPR) in a reactive oxygen species (ROS)-dependent fashion, and the UPR counteracts ROS accumulation by TNFα. J. Biol. Chem. 280: 33917-33925. Shkoda, A., P. A. Ruiz, H. Daniel, S. C. Kim, G. Rogler, R. B. Sartor, D. Haller. 2007. Interleukin-10 blocked endoplasmic reticulum stress in intestinal epithelial cells: impact on chronic inflammation. Gastroenterology 132: 190-207. Ruiz, P. A., A. Shkoda, S. C. Kim, R. B. Sartor, D. Haller. 2006. IL-10 gene-deficient mice lack TGF-β/Smad-mediated TLR2 degradation and fail to inhibit proi-nflammatory gene expression in intestinal epithelial cells under conditions of chronic inflammation. Ann. NY Acad. Sci. 1072: 389-394. Ciccaglione, A. R., A. Costantino, E. Tritarelli, C. Marcantonio, M. Equestre, N. Marziliano, M. Rapicetta. 2005. Activation of endoplasmic reticulum stress response by hepatitis C virus proteins. Arch. Virol. 150: 1339-1356. Lee, A. S.. 2001. The glucose-regulated proteins: stress induction and clinical applications. Trends Biochem. Sci. 26: 504-510. Wozniak, T. M., A. A. Ryan, W. J. Britton. 2006. 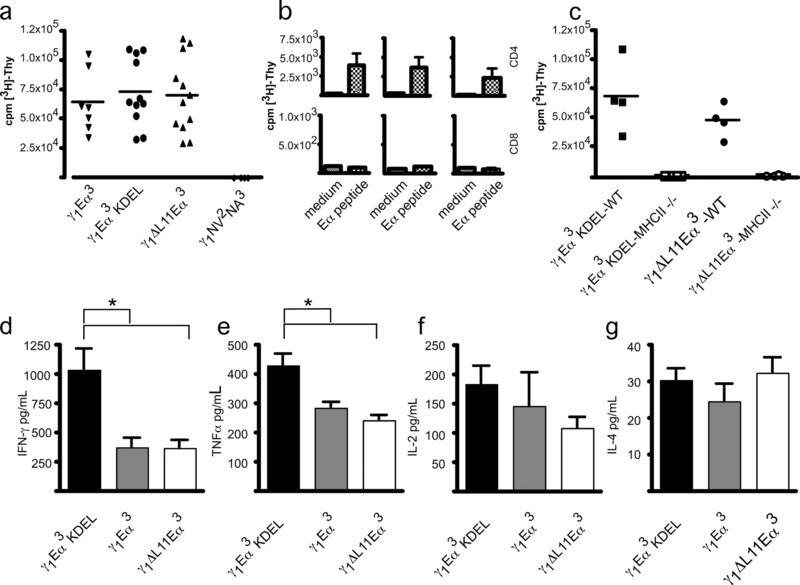 Interleukin-23 restores immunity to Mycobacterium tuberculosis infection in IL-12p40-deficient mice and is not required for the development of IL-17-secreting T cell responses. J. Immunol. 177: 8684-8692. Wiekowski, M. T., M. W. Leach, E. W. Evans, L. Sullivan, S. C. Chen, G. Vassileva, J. F. Bazan, D. M. Gorman, R. A. Kastelein, S. Narula, S. A. Lira. 2001. Ubiquitous transgenic expression of the IL-23 subunit p19 induces multiorgan inflammation, runting, infertility, and premature death. J. Immunol. 166: 7563-7570.